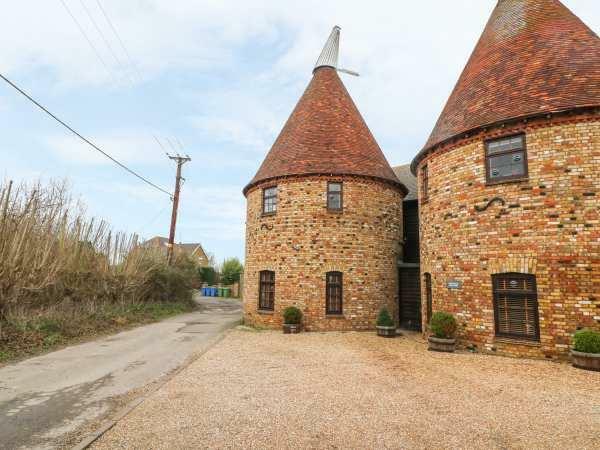 The holiday cottage of "Hop House" can be found in Oad Street near Sittingbourne in Kent. Hop House can sleep 14 people with 7 bedrooms to sleep your holiday party. Hop House has a bedroom makeup of: Seven bedrooms: 1 x king-size double with en-suite bath, basin and WC, 1 x king-size double with en-suite shower, basin and WC, 1 x double with en-suite bath, basin and WC, 1 x double with en-suite shower, basin and WC, 1 x ground floor double with en-suite wet room with shower, basin and WC, 1 x twin with en-suite shower, basin and WC, 1 x ground floor twin with en-suite wet room with shower, basin and WC. Kitchen. Sitting room (seats 6) with dining area (seats 6). First floor open plan living area with kitchen, dining area (seats 14) and sitting area (seats 11). This is a large cottage near Oad Street near Sittingbourne, and a good choice for sharing your cottage break with friends. These are the reviews for Hop House. There are 13 reviews. Nearby pub (10 minute walk) very friendly/good food. Location was perfect for access to central and north Kent. Fourteen of us stayed for the week and not a single complaint. Very roomy, beautifully furnished and extremely well equipped. It is well placed for exploring a lovely county. The equipment was excellent and the rooms spacious and comfortable. As this is only the second year its been available everything was new and in good condition. The internet connection was excellent and well set up. We especially liked the big round table for meals all together. We were pleasantly surprised by the supplies the owner made available as we arrived - including a couple of bottles of wine - very welcoming! And the kids loved the bubble wands that appeared the day before we left - huge fun. Thank you Sarah for a lovely holiday. The weekend was in celebration of our 40th wedding anniversary and had to accommodate three generations. The property has the wow factor immediately, and with seven en suite rooms from which to choose, each equally beautifully decorated and furnished, we avoided the usual bedroom-envy! 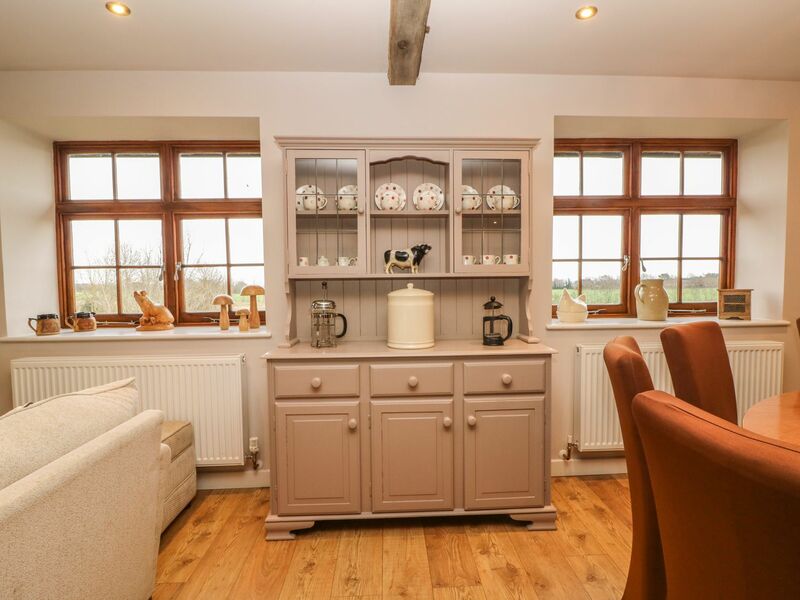 The main open plan lounge/kitchen/diner on first floor and has a lovely contemporary country feel. There is another lounge/diner and kitchen on ground floor leading out to garden. We had lots of garden fun and a bbq and the children liked using this room to rest or watch the obligatory Frozen on the tv. Sarah was the perfect host and we really appreciated the welcome basket and toys that had been left out for my grandchildren. My daughters are already planning a return visit, possibly for a family Christmas. As said in another review, the pictures don't do justice to the size and condition of the house. Everything was beautifully clean and the kitchen equipment was plentiful (something we have struggled with in previous accommodation, being a group of 11) and good quality. The Wifi was reliable and worked throughout the house. We had some lovely days out during the week - would recommend the gardens at Doddington, a trip on the Sittingbourne and Kemsley Light Railway and we also had a brilliant day at Diggerland! Very spacious and all the ensuite bedrooms fitted in beautifully.It really could hardly be faulted and the owner Sarah was charming & most helpful.Would definitely recommend it. The rooms were bigger than expected, en suite bathrooms to all 7 bedrooms was wonderful. Very well equipped with china, cutlery, kitchenware etc. Spotlessly clean and so many interesting pictures, art works, sculptures etc. Would recommend it to any large group. Booked Hop House as a suprise for mums birthday as we needed to sleep 14 people. The house is beautiful, spacious and clean. 7 large bedrooms all ensuite and plenty of quiet spots to rest and relax. Would definitely recommend and book again. Much larger than we expected with everything you would expect to find in a home. Well equipped kitchens and dining rooms. Owners were really helpful. Will definitely return. The owners are very thoughtful providing us with some essential food and drink. Great for a larger number of people and very relaxing. The owners are extremely helpful and provided a very thoughtful welcome basket. I highly recommend this delightful property. It’s ideal for a group of friends or family especially as all rooms are en suite. I would definitely like to return at some point. The facilities were great, our party had an age range of 9 years to 86 years and there was something for everyone - from games in the garden and quiet rooms downstairs to reliable wifi to keep the teenagers entertained There was plenty of space and the standard of the design and extra decorative touches in all the rooms made it feel very homely and comfortable. I would not hesitate to recommend Hop House and would love to stay there again. If you're looking for other cottages around Hop House, we've got some cottages below which may take your liking. There are 66 cottages within 10 miles of Hop House - and they have reviews too.